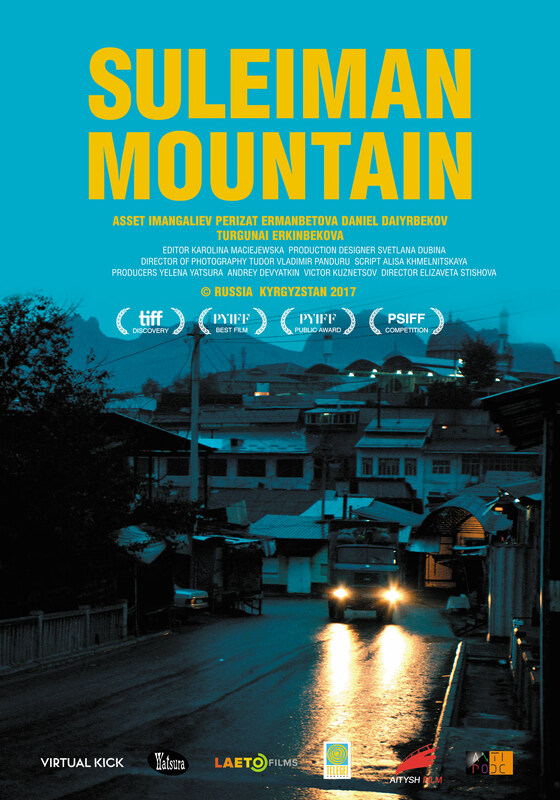 The production of Suleiman Montain brought together three countries and nine producers. Yelena Yatsura (Virtual Kick Studio) with Victor Kuznetsov and Andrey Devyatkin from Russia, who produced and distributed some of most important first features. In Kyrgyzstan, the film was supported by the most renowned Kyrgyz producers Sadyk Sher-Niyaz and Samat Sabraev, and Telegey Company. And finally, Radka Bardes, Tomek Moravský, New Europe Sales, and Jan Navazhevsky from Poland. Without this multilateral collaboration it would have been impossible to create this film. Yelena Yatsura, General Producer: “Suleiman Mountain for me emerged from the group of writers that I am most intrigued by within the world of Russian film. So I had to read it, at the very least. I had already worked with Alisa Khmelnitskaya, the scriptwriter, on her first script called 9 MONTHS, which became the debut for the now famous director Rezo Gigineyshvili (his film ‘Hostages’ took part in the Berlinale this year). For that project, we were working side by side with seasoned writer Gennady Ostrovsky (known for his work with director Pavel Lungin) and director/producer Bakhtier Khudoynazarov. I really liked Alisa’s new script, Suleiman Mountain. In film and in theatre some stories can be borderline bad taste, almost too much, and a love triangle is one of them. Particularly if it involves an older and a younger woman, and a man who comes across as a petty tyrant that the women have to fight for. I thought the idea of transporting this storyline to a different ethnic background was brilliant, with the exotic realities (a real mountain, the practice of having a ‘senior’ and a ‘junior’ wife) and the myths (the healing powers of the mountain) adding a special flavour to the mix. The passionate and explosive relations of the main characters as defined by the realities of Kyrgyz culture and everyday life looked great even on paper. I spent a long time planning to turn ‘Suleiman Mountain’ into a producer’s debut. Masha Yakubova had worked with Elizaveta Stishova on her short film ‘The Seagull’, and between them they knew more about how to film in Kyrgyzstan than I did. They secured a POV grant for the project, along with a lab at Black Nights, and brought in Tudor Panduru as Director of Photography. Nevertheless, the project turned out to be immensely challenging. It’s the debut film of a Russian director, using exclusively Kyrgyz narratives and language and without any support from state funds. Given the creative concept, the expeditions, the anamorphotic optics, the film was far from low-budget. My partners from other projects Andrey Devyatkin and Viktor Kuznetsov liked ‘The Seagull’, Elizaveta Stishova and ‘Suleiman Mountain’. And so that’s how the film was born. A mix of cultures stirred by a Russian creative impulse (writing and directing) turned into a dynamic and in many ways incredibly contemporary film”. “On the banks of Lake Issyk-Kul, a little boy covered in mud, alone, happy and occasionally angry, would hang around with us on the set. His mother would ring a bell to call the local children for their school lessons in the small single-storey high-school on the river. “Her call sounded more like the howling of a mother camel separated from her calf. “Despite the apparent silliness of this daily ritual, set against such a monumental landscape, the lonely figure of a woman calling for her son took on a tragic air. The film tells the story of the complex relations within a family that exists in a culture where the ancient practice of taking multiple wives is perceived as natural, which leads to dramatic emotional tension. The story is intertwined with the contemporary everyday life of a people that passionately engages in and celebrates ancient customs which can be traced back in the times when the Kyrgyz were nomads. Why Kyrgyzstan? Why such an exotic setting for such a universal story about a love triangle? The producer’s flair and subtle sensibility and the scriptwriters’ unique vision are complemented by the director’s strikingly poignant feel for the environment in which the film is set. Following the collapse of the Soviet Union, Kyrgyzstan reverted to the traditional ways of life, with Sunni Muslim and pagan customs and their native language making a comeback. The film is set against the backdrop of the final collapse of the Soviet Union and its cruel aftermath. Traces of the past can still be found in the interior design of the orphanage and in the traditional songs, but that world is no longer a part of today’s Kyrgyzstan. The young director manages to capture the remarkable moment when old traditions, such as shamanism and the practice of taking two, if not three wives, actually coexist with a relatively modern world in an almost documentary manner. The dilapidated old truck rolling past a billboard advertising high-speed internet in the middle of nowhere doesn’t feel out of place in the same frame. The country’s Soviet past has finally been left behind: the kids no longer know the songs about the war off by heart, and there’s no point looking for spare parts for an East German built truck. Central Asia has finally regained its identity, shaking off Russian influence and restoring its old customs. Kyrgyzstan is located in Central Asia, in the Western and Central parts of the Tien Shan Mountain range. Suleiman Mountain can be found close by to the town of Osh, and is a UNESCO heritage site. Soon the new family dynamics are stretched past their limits, and Karabas is caught between his old ways and the two women bearing his sons: one re-born and one yet to come. Now this unusual family must decide if they are to co-exist or tear each other apart as old wounds are ripped open and deception becomes the rule of the day. Shot on location in and around the mystic World Heritage Site of the Suleiman Mountain in Osh, Kyrgyzstan, SULEIMAN MOUNTAIN tells the coming of age story of a grown man who must first lose love in order to find it. ¿Qué cosas estabas buscando en el casting de Karabas? Estaba buscando a alguien feo, estaba buscando a alguien como Harvey Weinstein, ¿viste? Alguien por el estilo pero con más poder de hombre, estaba buscando poder de hombre. Pero después en Kyrgyzstan, había caras interesantes y caras lindas pero no encontré este poder de hombre. Entonces supimos de esta persona en Kazajistán y fuimos a hacer el casting ahí, y cuando lo conocí entendí que tenía algo, que era alguien a quien le gustaba mirar sus propias fotos, mostrárselas a todos, y ahí pensé esto puede ser, él lo puede hacer. Las dos películas ganadoras del Festival están dirigidas por mujeres, ¿creés que las mujeres están ganando espacio en la industria? Creo que sí. En general las mujeres no tenemos la misma presión de generar dinero que tienen los hombres, entonces podemos abocarnos más al cine, los hombres están trabajando más en series que les dan estabilidad y plata. “Suleiman” is the feature debut of Elizaveta Stishova, a Russian helmer who returned to the rugged Central Asian nation where she lensed a short film and worked as first A.D. on Sadyk Sher-Niyaz’s 2014 historical epic “Kurmanjan Datka Queen of the Mountains.” Their journey takes audiences into a colorful world of folk traditions and shamanistic rituals, offering a rare big-screen spotlight for Kyrgyzstan. Shooting in the Central Asian nation proved to be a challenge for the Moscow-born helmer who had to hustle to bring pic to completion. The Pingyao Crouching Tiger Hidden Dragon International Film Festival closed its first edition Saturday with prizes for winners of its international and Chinese sections… “Suleiman Mountain,” directed by Elizaveta Stishova, collected the Roberto Rossellini prize worth $10,000 for the director’s next film. The jury praised the picture for its “incredible” female characters. Audience awards went to “Suleiman Mountain,” Ficarra & Picone’s “L’Ora Legale” (Italy), Aida Begic’s “Never Leave Me” (Bosnia/Turkey), Peng Xiaolian’s “Please Remember Me” (China), Ana Urushadze’s “Scary Mother” (Georgia/Estonia) and Peng Fei’s “The Taste of Rice Flower” (China).